The mass media can be used as a powerful tool to convey strong and provocative messages. This notion is in collaboration with Lord Justice Leveson’s statement ” the press provides an essential check on all aspects of the public. That is why any failure within he media affects all of us”. Furthermore, journalist Ilina Ghosh further elaborates on the idea by stating the “Mass media is an unavoidable and indispensable presence that has the power to shape our society”. Moreover, the question remains, does it matter who owns the media?. Historically, one could point towards the actions of Adolf Hitler during the 30’s and early 40’s as evidence it does. However, one mustn’t rummage through bygone times for answers. As the present day examples stare you in the face. I take a keen interest in the American media, and how major stakeholders seem to skew their supposed objective publications. For example, the Washington Post is owned by Jeff Bezos. It has been documented that he is a Democrat and thus his views lean to the left. This is evidenced by the statistic that “since 1988 some 88 percent of Bezos’ donations went to Democrats.” So, it is no surprise to witness a liberal skew to even the most tragic of stories coming out of the Washington post. A recent example is a story run by the post, pertaining to the death of famous Republican first lady Nancy Reagan. The 3,300-word obituary was written by Lois Romano, the current editor of Washington post live. It was reported to have a liberal bias due large negative connotations throughout the piece. Evident by the phase “As first lady from 1981 to 1989, Mrs. Reagan had a knack for inviting controversy” . This phase was only the third sentence in the piece and was the first of many verbal slams in the obituary. In this case, it certainly does matter who owns the media, as it causes the neutral media audience to observe a slanted view on an objective topic like a death, based on lingering political disdain. Professor of Communication at Depauw University Jeff McCall stated of the media in America, “The Founding Fathers would be disappointed, because they would have wanted the independent press to be a watchdog for the powers that be.”. However, the press isn’t watchdogs, they have slowed turned into a channel to push an agenda. The agenda of the owner of the publication. Take Fox News for an example, during the 2012 presidential campaign Fox owner Rupert Murdoch was very open about the candidate he backed, even going as far to say in reference to Mitt Romney, “Of course I want him [Romney] to win, to save us from socialism”. So, it is not shocking to see that Murdoch views are echoed throughout his publication. Who, carry the slogan “Fair and Balanced”. However, there is nothing balanced about how Fox News presented the final week of the election. According to PEW research, Fox News increased the “amount of negative coverage of Obama from 47% in the first four weeks of October to 56% the final week”. Meanwhile, positive talks around Romney increase by almost 10%. However, the liberal publication MSNBC also displayed similar behaviour. In their case, positive talks concerning Obama jumped from 33% during most of October to 51% during the last week. These statistics act as undebatable evidence that it does matter who owns the media. Due to the fact, Murdoch’s and Phil Griffin’s(MSNBC) views have been channelled through their publications, who strive for fair and balanced journalism. In effect, they are altering the views of their viewers in an effort to further their presidential agenda. Center, P.E.W.R. ed., 2012. The Final Days of the Media Campaign 2012. Pew Research Centers Journalism Project RSS. Available from: http://www.journalism.org/2012/11/19/final-days-media-campaign-2012/ [Accessed March 29, 2016]. Ghosh, I., 2014. Voices of the World. Voices Of The World. Available from: http://www.voices-of-the-world.org/politics-and-economy/do-we-have-any-control-over-it/ [Accessed March 29, 2016]. Irvine, D., 2016. Washington Post Slams Nancy Reagan in Obituary. Washington Post Slams Nancy Reagan In Obituary. Available from: http://www.aim.org/don-irvine-blog/washington-post-slams-nancy-reagan-in-obituary/ [Accessed March 29, 2016]. Leveson, B., 2011. LEVESON INQUIRY:CULTURE, PRACTICEAND ETHICS OF THE PRESS. The Leveson Inquiry. Available from: http://webarchive.nationalarchives.gov.uk/20140122145147/http:/www.levesoninquiry.org.uk/ [Accessed March 29, 2016]. Little, M., 2012. Rupert Murdoch wants Romney to win despite criticisms. LA Times . Available from: http://www.latimes.com/news/politics/la-pn-rupert-murdoch-wants-romney-to-win-despite-criticisms-20120702,0,772977.story. 2 july 2012. [Accessed March 29, 2016]. W.F.B.S. ed., 2013. 88 Percent of New Washington Post Owner’s Donations Went to Dems. Washington Free Beacon. Available from: http://freebeacon.com/issues/88-percent-of-new-washington-post-owners-donations-went-to-dems/ [Accessed March 29, 2016]. M.S.P., 2013. Mediaite’s Joe Concha Talks Media Bias, MSNBC Acting As WH ‘Infomercial’ On O’Reilly. YouTube. Available from: https://www.youtube.com/watch?v=kdl6d2muasm [Accessed March 29, 2016]. Interesting points you’ve made and I completely agree, the only way were going to change this media monopolization is by getting the discussion going. 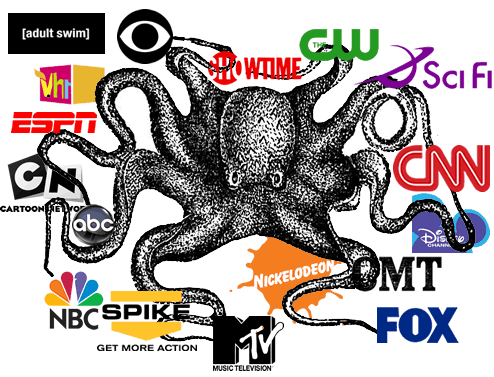 It might interest you that a study of the American Media in 2004 uncovered that a total of only FIVE corporations owned the vast majority of the media. A frightening statistic. In my blog “The Truth of it All” I took a look at the media in Australia and how international media mogul Rupert Murdoch has already monopolized the media in Australia, owning the majority of all of it’s capital newspapers. The media dictates how the population thinks, and the idea that the media can be controlled by a small handful of elites can only be bad news, I think we may be entering into an era of Media Indoctrination.